The SUNY College of Environmental Science and Forestry (SUNY-ESF) joined the New York State Energy Research and Development Authority (NYSERDA) and the New York Biomass Energy Alliance Oct. 22 in celebrating National Bioenergy Day with activities to educate the public about cleaner, more efficient ways to heat with wood and the value of sustainable forestry. The celebration featured information about Governor Andrew M. Cuomo's Renewable Heat NY initiative, a tour of the college's combined heat-and-power (CHP) system at the Gateway Center, remarks about the bioenergy industry in New York State and a tour of a pellet boiler demonstration system. National Bioenergy Day celebrates the role that this sustainable, renewable, carbon-friendly resource plays in producing electricity and heat generated from wood and other organic materials. "It's great to join with our partners at SUNY-ESF, a model of environmental stewardship and sustainability, as well as the New York Biomass Energy Alliance to celebrate National Bioenergy Day," said John B. Rhodes, President and CEO, NYSERDA. "New York State is committed to promoting high-efficiency, low-emissions wood-fired heating technology and to expanding the bioenergy industry through Governor Cuomo's Renewable Heat NY initiative." Renewable Heat NY, a $27 million initiative, promotes the highest efficiency class of wood-fired heating technologies in the nation and is expected to make New York State a national leader in developing this low-emissions industry. Environmental and public health benefits, along with a reduction in fossil-fuel use, an increase in sustainable forestry, and the expansion of the wood pellet and equipment supply chains, will benefit communities across the state. The program provides incentives to homeowners and businesses to purchase cleaner, more efficient pellet and cordwood boilers and pellet stoves. The SUNY-ESF Gateway Center's CHP system is twice as efficient as traditional technologies that produce solely heat or electricity. This combined system is designed to simultaneously produce both heat and power, and to use local biomass in the form of wood pellets to power the biomass component of the CHP system. "SUNY-ESF is unique because all of its educational and research programs are oriented toward the sustainable management of natural resources in both natural and designed environments," said Bruce Bongarten, provost and vice president for academic affairs, who welcomed the visitors to campus for the event. "All of ESF's programs serve the mission of achieving a sustainable world. Bioenergy is an important part of a number of programs and projects that SUNY-ESF has underway." ESF's Climate Action Plan includes a goal of carbon neutrality, and sustainable management of ESF's forest land and use of bioenergy are key parts of reaching this goal. In addition to the Gateway Center CHP system, at SUNY-ESF's regional campuses in the Adirondacks and in Tully, N.Y., sustainably produced woody biomass is used to heat facilities. The college is currently installing a small-scale pelletizer to explore ways to improve pellets as a sustainable source of bioenergy. It also has been involved for almost 30 years in developing willow biomass crops in the state as a source of woody biomass and is now assisting landowners who are growing this energy crop in Northern New York. "Almost every component of a bioenergy system can be manufactured or grown right here in New York," said Matt McArdle, chair, NY Biomass Energy Alliance, and president, Mesa Reduction Engineering and Processing. "From the design and fabrication of large scale and residential systems, to the responsible harvest of timber to the manufacture of pellets, it's all happening here." Currently, the bioenergy industry directly and indirectly employs an estimated 4,000 New Yorkers, and the use of bioenergy for heating saves New York home owners and businesses approximately $32 million a year, according to McArdle. 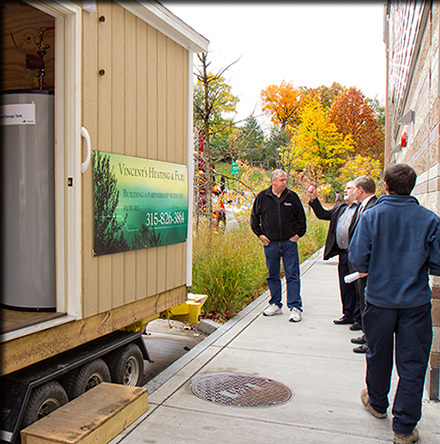 Thursday, Oct. 23 in Rensselaer: Tour the New York Forestry Resource Center's wood pellet boiler and view the residential high efficiency/low emissions cord wood boiler demonstration and screening of the Community Biomass Energy film. Saturday, Oct. 25 in Ithaca: Tour residential homes that recently converted to wood pellet central heating systems, and talk with homeowners about their experiences. Thursday, Oct. 30 in Fort Drum: Celebrate the commemoration of the largest renewable energy project in the history of the U.S. Army at Fort Drum.